This was my first NASA Social — an event where NASA invites active social media users to do things like tour facilities, see a launch, and learn about specific upcoming missions. Despite having watched other people’s experiences with past events, I only had a vague idea of what to expect. Each event is a bit different, depending on the facility and the reason for the Social. The last time I’d seen a NASA facility behind the scenes was in 1993, on a summer camp visit to the Wallop’s Flight Facility when I was 12 years old. First, we learned about TESS, a satellite slated to launch in 2017. The project will be looking at relatively nearby stars for exoplanets (that is, a planet that exists outside of our own solar system). One of the typical ways to go planet-hunting is to closely watch a star for changes in brightness. Essentially, when a planet passes in “front” of the star it orbits, you can detect a very small change in the apparent brightness of the star. Astronomers call this the “transit method” of detecting an exoplanet. It’s a pretty reliable way of finding these far-away planets, and scientists have had considerable success with this method — they’ve found some 1,800 of them since the first was detected about two decades ago. Finding planets, and knowing that they exist, is a first step. We can also determine a planet’s approximate size based on how much the observed star brightness dips when the planet passes in front of it (i.e., the bigger the planet, the bigger the dip in brightness). Then, there’s figuring out what the planets — and their atmospheres — are made of. Knowing that is important, particularly if we’re interested in finding Earth-like worlds with atmospheres that we think could support life. In order to determine atmospheric composition, you generally need to have a bright star — a far-away, dim star that gets ever-so-slightly dimmer during a planetary transit makes it difficult to get the necessary data because the observed change is so minute. Because the stars that TESS will be observing are closer, they’ll be brighter, and that means that they’ll be easier to observe in this way. Stephen Rinehart, TESS Project Scientist, sees TESS as a “target finder” — cataloguing the best candidates for follow-up observations with advanced telescopes like the JWST, allowing scientists to determine an exoplanet’s mass, size, and density, as well as atmospheric composition through spectral analysis. Next, we visited the Conceptual Image Lab, where artists create animations and visual effects to show and explain science concepts in a way that’s engaging and visually compelling And they have one really cool office! The CIL folks recently worked on an animated short film for the OSIRIS-REx mission, which will visit an asteroid called “Bennu” and return a sample to Earth. Take a look! 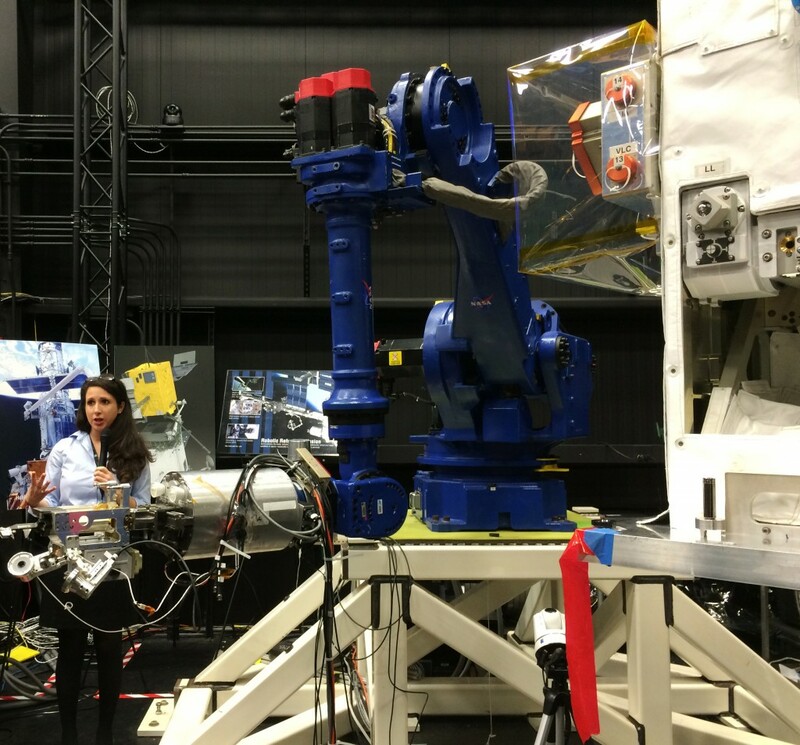 Entering the Satellite Servicing Capabilities Office (SSCO) means walking into a small warehouse full of robotic arms and large components of space hardware. The walls are painted a matte black to help simulate the contrast that would be present in space. SSCO develops and tests technologies and robotics that allow satellites to be serviced when they’re in need of repair or some other type of on-orbit work. 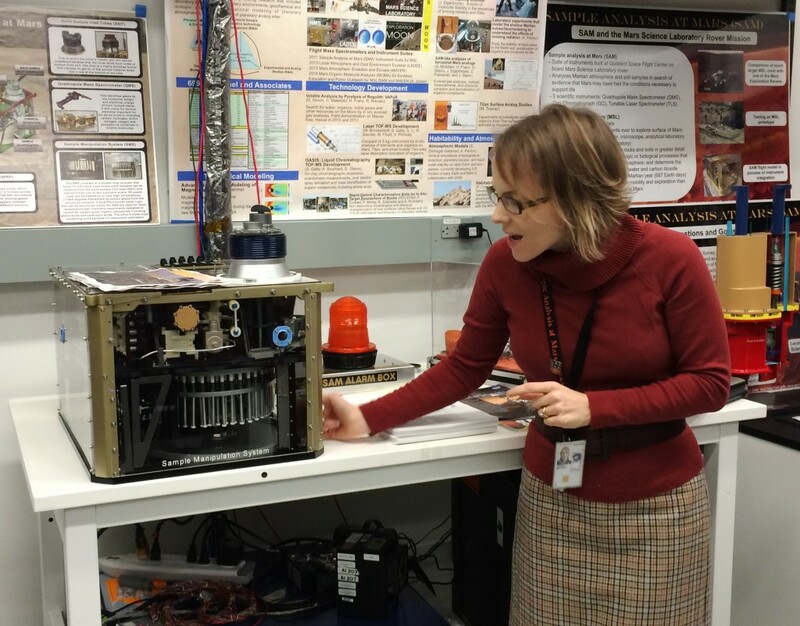 We had an opportunity to see the Sample Analysis at Mars (SAM) instrument, an Earth-bound copy of the instrument that’s installed on the Mars Science Laboratory (MSL) “Curiosity” rover that’s currently carrying out its mission on the surface of Mars. SAM was built at Goddard, and the terrestrial version remains there. Melissa Trainer, a planetary scientist with NASA, explained how the unit, about the size of a small microwave oven, is capable of heating soil samples to 1000 ºC. Heating the samples breaks down the minerals contained in the soil and allows them to be analyzed using the SAM’s various instruments, like the gas chromatograph and mass spectrometer. SAM is tested in an environment like that on the Mars rover, in terms of atmospheric pressure and composition, using a special chamber housed in the SAM test bed lab. Any analysis or experiment that scientists want to execute on Curiosity must be run in this test environment first before being carried out on Mars. The test on Earth gives an idea of how long the experiment will take and how much power it will require, which is important because Curiosity’s time is carefully coordinated and planned. Ultimately, Curiosity is looking for signs of habitability on Mars. While this isn’t directly a “search for life,” the aim is to determine if conditions may have been conducive to some form of life on the Red Planet. The rover’s instruments, like SAM, are geared toward detecting organic molecules and compounds in ancient sediment and rocks that would be needed to have supported life, or that life might’ve left behind. Jamie Cook, astrochemist, led us through the Astrobiology Analytical Lab, where scientists are looking for some of the building blocks of life — like amino acids — in meteorites, comets, and other extraterrestrial samples from our solar system. We were able to inspect several meteorite samples from a 1969 impact in Mexico. Jamie related that we were holding an object that’s “older than dirt” — literally — since it comes from a time when the Solar System was still being formed. Most of the meteorites that are studied in this lab were collected in Antarctica, for several reasons: they’re easier to find (since dark objects stand out well against a snowy backdrop), there’s less chance of biological contamination than more inhabited parts of the world, and meteorites tend to be concentrated in certain spots due to ice sheet movement. While recovering meteorite samples is one way to analyze objects that came from outside of the Earth, it can be problematic. We don’t necessarily know what parent body the meteorite came from, for one, so it’s difficult to know much about sample if we find something interesting. Did it come from a comet? An asteroid? Debris ejected from an impact with another planet? That’s why so-called “sample returns” are highly desirable. While we can do a fair amount of analysis on samples with the mini-laboratories installed on probes — like the SAM on Curiosity — we can do a lot more with labs here on Earth. So, sometimes we send spacecraft to a target, like a comet, asteroid, or planet, and have it return samples to Earth. A recent example was NASA’s Stardust mission that flew through Comet Wild 2’s tail and returned samples to Earth in the mid-2000s. JAXA, the Japanese space agency, recently launched the Hayabusa 2 spacecraft that will intercept an asteroid and return samples for analysis. NASA is planning to launch their own asteroid-rendezvous probe, OSIRIS-REx, in 2016, intercepting Asteroid Bennu in 2019, and returning samples in 2023. Another advantage to sample returns is that only a portion of the material is used immediately for scientific analysis. The rest is kept for future use, so that scientists can study the samples with better instruments as they’re developed in the years to come. This is a really important advantage of bringing samples back to Earth — we’re still working with samples returned from the Apollo Moon missions, gleaning new data and doing analysis with instruments that are more sensitive and that didn’t even exist in the 1970s. After grabbing a quick lunch at the Goddard employee cafeteria, we hurried over to the TV studio to join a two-hour Orion program being broadcast live on NASA TV from Kennedy Space Center in Florida. We heard from Charlie Bolden, NASA’s administrator; numerous program heads; and astronaut Rex Walheim about the Orion program, the Commercial Crew program, and the importance of the next day’s test flight. Two of our Goddard NASA Social attendees were able to ask questions of the presenters, too, as part of a remote Q&A session. While the Orion capsule alone can’t take humans on the nearly three-year roundtrip journey to Mars, it is one important component, and it’s clear that NASA sees EFT-1 as the first step on a “journey to Mars” and the future of American crewed spaceflight. The Network Integration Center, or NIC, is essentially a hub that connects and coordinates communications between ground stations, the NASA TDRS satellites, and spacecraft that happen to be using the TDRS system to communicate with Earth. TDRS is a system of satellites that provide nearly continuous communications coverage between on-orbit spacecraft and ground stations. Before TDRS, NASA had to rely on a patchwork of receivers on Earth to relay radio signals to places like Mission Control. In those days, as a spacecraft would pass over a part of the Earth that didn’t have a ground station set up to receive its signal, controllers would lose contact with the spacecraft. The space-based TDRS system provides much broader and more reliable coverage. We were granted the privilege to visit the NIC — not your average Goddard tour stop, apparently — but we had to turn off all radio-capable devices, like cell phones, to minimize interference with the sensitive systems inside. 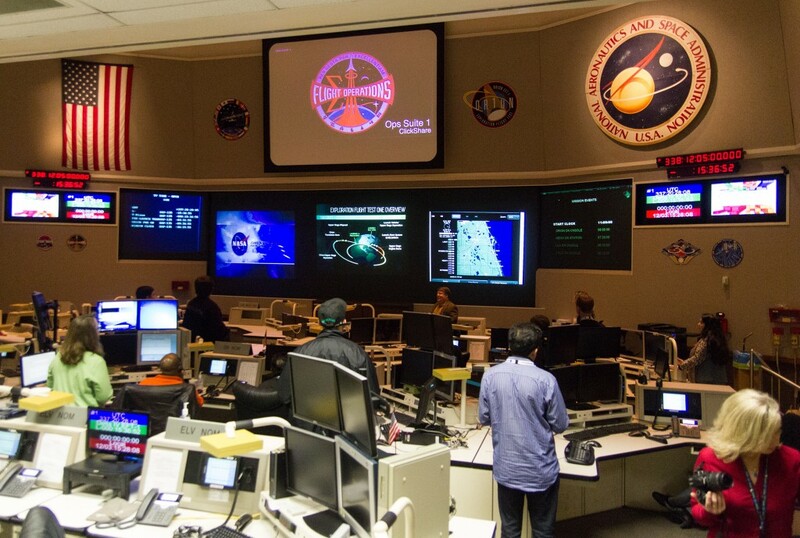 The room has a “Mission Control” feel to it, with rows of workstations, each with its own set of multiple monitors, consoles, and other displays. A series of large screens at the front of the room show various data. On the day we visited, the NIC was preparing to support the EFT-1 Orion test flight communications. With all of our phones back on and out of airplane mode, we left the NIC building and boarded the bus over to the High Bay Clean Room, where the James Webb Space Telescope (JWST) is being assembled. 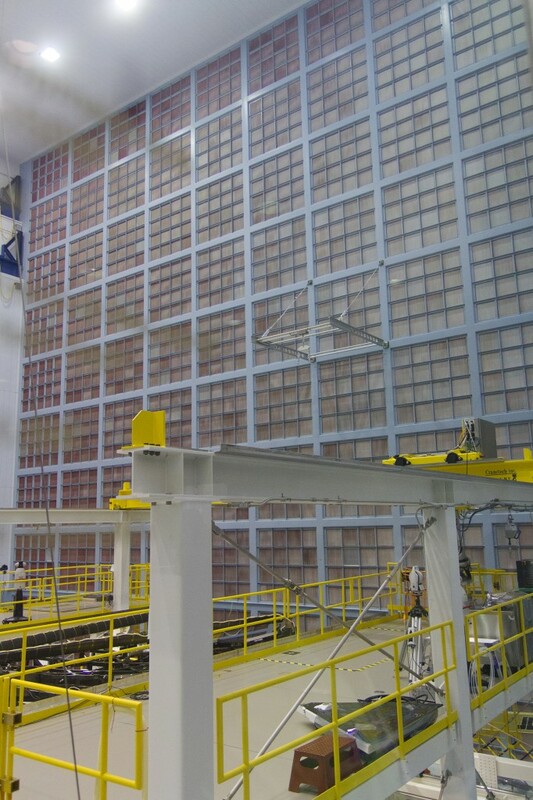 The clean room at Goddard is the largest of its kind in the world. An entire 9,000 square foot wall is devoted to HEPA air filters. These filters aren’t like the ones in your home heating and cooling system — they’re designed to last for decades before being changed. Keeping dust, dirt, and other contaminants out of the room and off of space hardware is critically important, especially for a highly sensitive optical system like a space telescope, where a single smudge could make a critical difference in its performance. The actual scale of the room is staggering. We weren’t able to enter the clean room itself, of course, but we were able to view the activities going on inside from a special second-floor window. If you’d like to have a look inside, there’s a live webcam available. You’re likely to see components of the JWST laid out or being worked on. The JWST is our next-generation space telescope, carrying on the legacy that Hubble’s 25 years in space (and counting!) began. The James Webb will be larger, more sensitive, and parked far away from Earth, allowing it to see further back in time and in different wavelengths of light than Hubble. In order to keep the telescope cold — which is important for its sensitive instruments — engineers developed a special sunshield material that deflects most of the Sun’s energy. 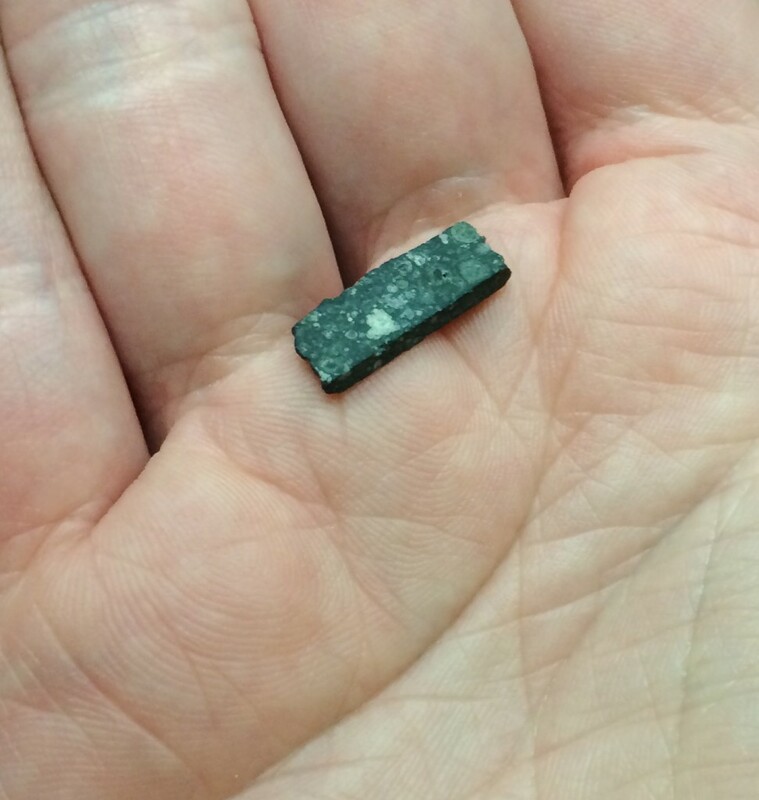 We had a chance to hold a small sample of the material; it essentially feels like a thick piece of Mylar. It’s so effective at blocking the Sun’s rays that it’s the equivalent of a 1,000,000 SPF sunscreen — something to try the next time you head out to the beach! Our last stop of the day brought us the Satellite Testing and Integration Facility, where space hardware is subjected to numerous rigorous tests to ensure that it’s ready to endure the stresses of spaceflight. Janet Thomas, environmental testing engineer, gave us a guided tour through several different areas located across this sprawling facility. We stood inside the Acoustic Test Chamber, which is essentially a massive four-story-tall room that contains six-foot-tall speakers. They produce sound at up to 150 dB — like “standing next to a jet taking off” — and subject everything inside the chamber to vibrations, similar to the conditions cargo experiences during a launch. Want to make an test pilot feel Lilliputian? Try telling them they need to climb into this centrifuge and pull a few Gs. Well, maybe not — this gargantuan machine isn’t for subjecting humans to the rigors of high G-forces, it’s for testing space hardware. In fact, it can accommodate up to 5,000 pounds and can subject it to up to 30 Gs! That’s an incredible amount of force — according to Goddard, a typical Space Shuttle launch subjected equipment in its cargo bay to about 6–7 Gs. “The other half of this is in the basement,” Ms. Thomas said, as we approached a hulking silver chamber that stretched nearly to the ceiling. Standing at the bottom, the chamber stretches about 40 feet overhead and spans 27 feet from side-to-side. From the outside, it looks a bit like something I’d imagine from a Jules Verne novel. 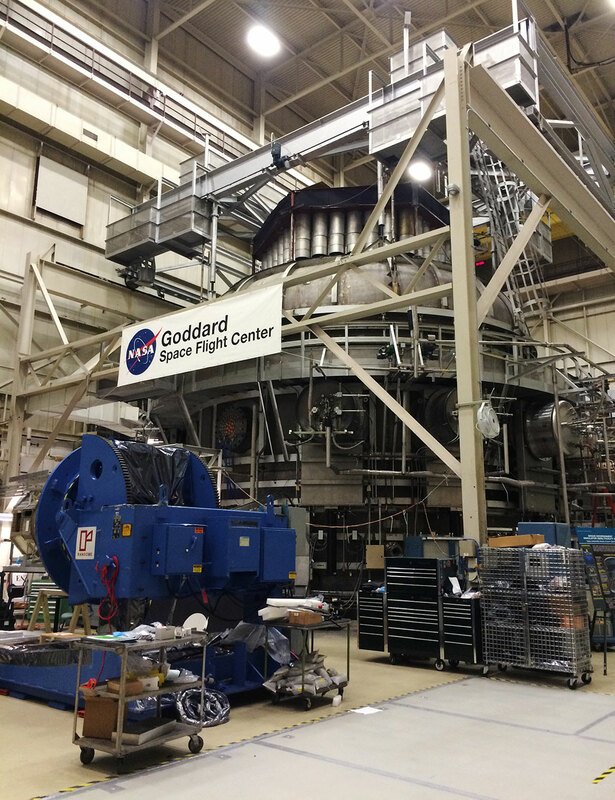 But it does just what it says on the tin: it simulates the space environment by removing almost all air from the chamber, and is capable of cooling the room to –310 ºF or heating it to 302 ºF, subjecting spacecraft to the hostilities of space while right here on Earth. If problems are found, they can be corrected before the hardware actually flies. By the end of the day, just before 5:00 PM, we boarded the bus for the last time and headed back to the Visitors Center to say our farewells and pack up. Although the sky had been grey throughout the day, the sun finally peeked through the rippled clouds on the horizon now, dappling faint pinks and oranges onto the sky. A beautiful ending to an amazing day. 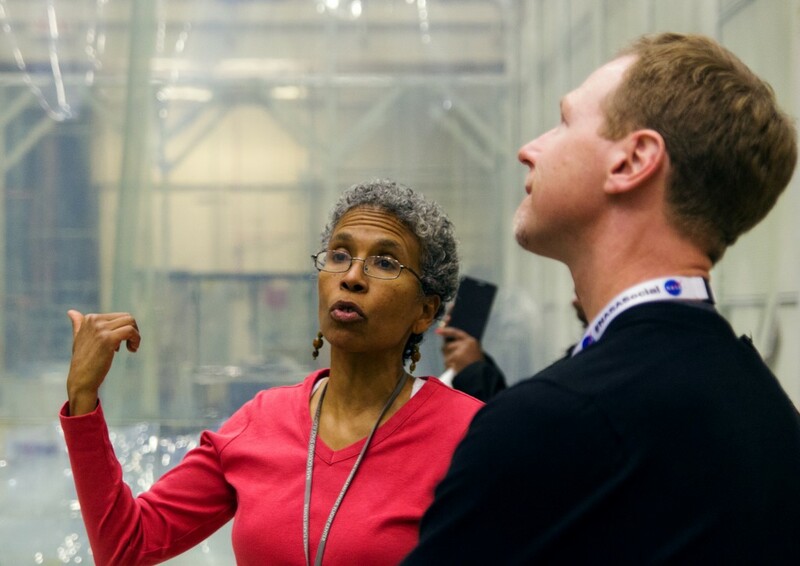 Even as a self-professed “space geek,” this experience made me realize that I had no idea of the extent of the work that goes on at Goddard — and it’s just one of many NASA centers spread across the country. The work is varied and vital to our space program; and, indeed, to our understanding of ourselves and our place in the universe. If you have an opportunity to apply for a NASA Social in the future, do it. I want to thank NASA Goddard and all of the employees who graciously offered their time and expertise, with an undeniable and infectious enthusiasm for their work. A special thank-you goes to Aries Keck, Goddard’s social media coordinator, for arranging the tours and speakers, not to mention keeping us all on-schedule and getting the most out of a packed day!